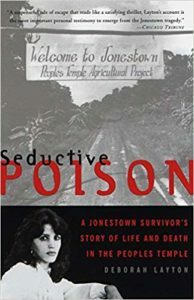 For years I have been curious about Jonestown – more about the people who followed Jim Jones to their deaths than about the man himself. A couple of years back I read Julia Scheeres’ “A Thousand Lives” (a brilliant book in its own right), a thorough journalistic look at Jones and his followers. Deborah Layton laid herself bare in “Seductive Poison,” detailing how she herself got drawn in to Jones’ orbit, her rise to power in Peoples’ Temple, her disillusion, escape, and putting her life back together. I must also say that Kathe Mazur’s performance was superb! Her depiction of Jones – in either his caring or brutal persona – was chilling and believable. Deborah’s fear, sorrow, and fumbling are portrayed realistically. If you have any interest in Jonestown specifically, or indoctrination in general, or if you like to read about resilience against impossible odds, read this book! I loved it completely. But it wasn’t just the story. It was just a very good quality book. Not even a world class seminar could hold my attention for fourteen whole hours!!! I mean, like…C’mon now? Kathe Mazur’s performance was sssssooooo incredible!!! I couldn’t believe that she WASN’T the author of the book. She’d totally embraced every single nuance of the protagonist’s experience. Great job Kathe!!! This book is for anyone who thinks that it could (being swept up in a cult…even for just a few Sundays) NEVER happen to them. In this case, the author was entangled in this (Jim Jones) cult/culture for over five years. We’re talking seven days a week; practically twenty+ hours a day!!! That’s commitment. How sad that it was so full of deception and criminal activity. One thing that this book has proven to me for sure is that: Jim Jones had pretty much duplicated himself through the naivete of his followers. He kept his own filthy hands out almost every dirty deed that was done (baring all his sexual assaults). It amazes me how much one man could’ve spent so much time under the proverbial radar, and leave the country with over nine-hundred members in tow; temporarily unscathed . When I review all the things this woman went through…And all the things that she’s put herself through, it causes me to pale in comparison when I think of just how LITTLE I actually contribute to my own organization. And it’s not even a cult. This book was definitely an eye opener for me: this book has “revolutionized” the very core of my ho-hum church life. I would recommend this audiobook. I would recommend it for the purpose of enlightening any individual that is skeptical of the influence of mad men. I suppose there are many examples of people who in history have brainwashed whole congregations and still do to this day. My book group read Layton’s affecting memoir a while ago. It was compelling then but with this remarkable new audio version what I missed while reading is made far more real and powerful. Hearing the author read her open the recording transported me immediately into the story. Although most is narrated by the wonderful Kathe Mazur, the author’s voice set the tone, creating a haunting sense of urgency. Filled with innocent yearnings, Layton’s gradual realization that she was used and misled and might die for her naiveté propels this story into its heart pounding, edge of your seat escape. Layton’s lovely voice returns to read her last two chapters. Unlike the book, the Audible version has a new Afterword which brings the story full circle. An honest, beautifully written & Essential Audible Listen. Hard to believe that so much suspense could be generated by a book that tells a story that is known so well. We all know how it ends, as we all knew what happened at Little Big Horn and on the Titanic. Yet Deborah Layton’s first hand telling of the tale breathes life into the lurid headlines and puts a face, so many faces to the victims of this horrendous tragedy. Touching and chilling, “Seductive Poison” is a true cautionary tale that reads like a thriller. A must-read. The author takes very hard looks at Jim Jones, cult madness and herself/ mother in an attempt to explain how something like this did happen. I do recommend but beware it’s a gripping and heartbreaking story that will stay with you like it or not. I have questioned for years how it would be possible for someone to fall into the grasp of a cult. I’ve secretly always believed that I could see myself being swooped into one if the conditions were “right.” I now know after hearing the words of one who was lucky on all levels to have survived that I was right in my secret. Anyone could fall prey to a monster when he first appears to be the only one who can understand you. Heart Breaking. Amazed anyone could survive this tragedy and go on to build a life. This is one very strong woman. This book is a very insightful and self-critical account of life in a sect. Also, despite its lenght, very involving. Bought on audible. I was transfixed from the get go. A lesson for us all. So sad. It’s hard to review someone’s personal experience. Overall I enjoyed the book as it gave a personal account of what the author experienced when she was a troubled teen, looking for help and was introduced to a church by her brother. I found the narrative slow to start but gripping later. What spoilt it a little for me was the introduction which tells the reader what happens at the end. Although I knew a little of the history this revealed a lot of details I didn’t know. I would rather have read the memoir and then have a commentary filling in the details. Also there wasn’t any attempt to analyse what happened, it is simply one person telling her story which I think made it more powerful for me. Truly harrowing in places. This account of Layton’s experiences left me aghast at how easily we can be mislead and betray our friends and family.